Now, I know I’ve been posting reasonably frequent offerings of beetle-ey goodness in the past few months, pretty much exclusively of sub-bark-dwelling and sleepy overwintering larvae. Although they are hecka-cool and did much to whet my Coleapetite, they just can’t compare with the thrill of REAL beetles, as in, ADULTS with ELYTRA and SHINY. I have been dreaming of this moment since November ’09, the Coleopterans’ last hurrah for the season. As you know, I was powerfully drawn to the local bird sanctuary a few days ago (although, I’m not 100% certain whether it was the pull of sunshine or the push of procrastination). There I found all kinds of woody nooks and crannies that were considerably warmer and drier than those near my home, and positively dripping with the possibility of discovery. And discover I did. The usual earthy offerings of mites, slugs, and myriapods…but also, finally, beetles. This small Ground Beetle (Carabidae) was one of many tucked away in this particular log. They scattered quickly when disturbed, melting away into the nearest shadowed space as if they’d never been there in the first place. This one paused briefly before scampering off, although it seemed a bit confused about the whole “hiding” thing…it merely stuck its head into a crevice, leaving its abdomen completely exposed and visible. I poked it gently with my finger. It seemed either startled or incensed, and dashed away to join the others. The Ground Beetles are one of the most common families; incredibly abundant, widespread, swift and successful hunters of Small Things. Although the one pictured above is quite small (only about 6mm) and rather bland, some Carabids are quite large and flashy, boasting a rainbow of colour, iridescence, and sculpturing. My personal fave in my current collection is the firey hunter, Calosoma calidum. My first discovery of this species, which is large, black and adorned with incredibly orderly rows of iridescent red punctures, was met with a jubilant woop and an in-the-air-fistpump when I pulled it out of a pitfall trap catch. 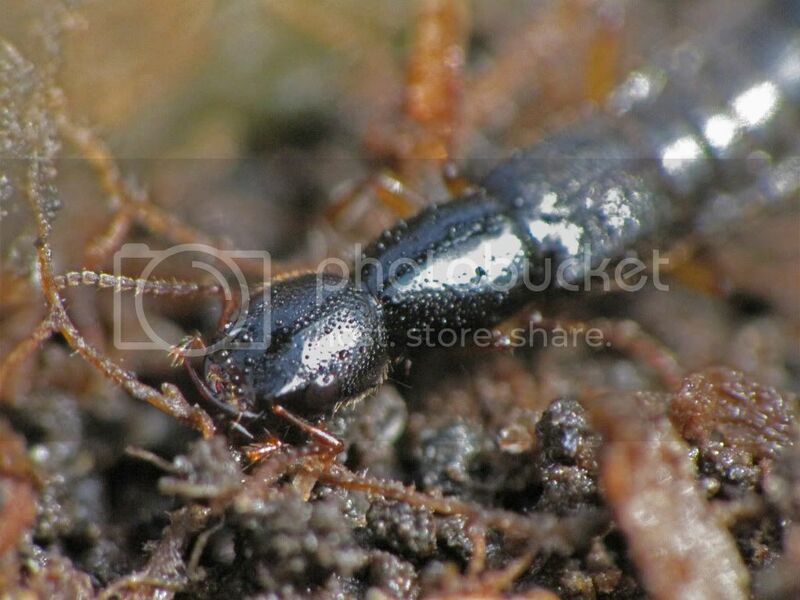 Another common ground-dweller is the Rove Beetle (Staphylinidae). I’ve written about these before, and they really are quite marvelously quirky-looking beetles. Not very “beetle-ey” at all, actually, with those stubby little elytra (hard outer wings) and thin, wormy abdomen. This little guy was quite still for me; I think it was still too chilly to move as its log had not yet been basked in warm sunshine that morning. Check out the long, sickle-like mandibles on this guy. Those are some pretty impressive chompers. They are, undoubtedly, designed for making meals of smaller critters, but these unfussy Staphs will also sup on dead plant and animal matter. I’ll save my last beetle finds of the day for the next post…stay tuned! Glad to hear you’re finally finding some beetle action up in the northern hemisphere. Love the carabid shot. These guys, in my opinion, are the most quintessential beetles. The rove beetle, while cool, is just a Dermapterid gone wrong! I have to agree with you, Peter, Carabids are just so darn…BEETLE-EY. I love them. They’re my faves too. “Coleapetite” – I love it. 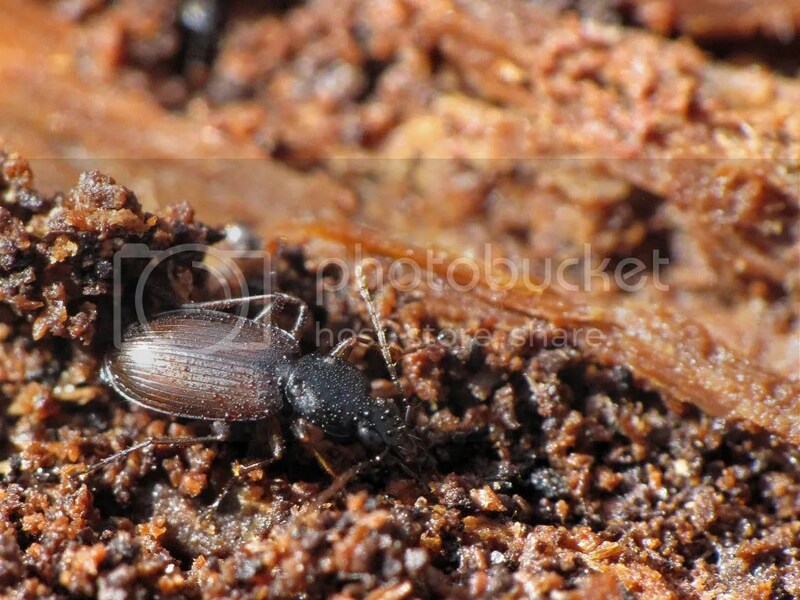 The small carabid is known as the Ostrich Ground Beetle. Fiery Hunters are good, but my favorite ground beetles are TIGER BEETLES! And your favourites are Tiger Beetles???!?!? NOE WAI!!! I’m laughing about the beetle sticking its head under cover with the rest of its body hanging out in the open. Seen that! Delightfully funny when it happens. It always makes me want to have a discussion: um, head in the sand not equal to invisibility; I can still see you; yes, still; and even now. LOL that’s pretty much what went through my head. I did actually chuckle out loud, and had a few words with it about its technique.